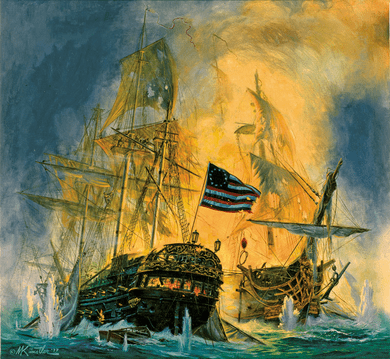 Mort Kunstler Handsigned and Numbered Limited Edition Giclee on Canvas:"I Have Not Yet Begun to Fight!" Title: I Have Not Yet Begun to Fight! About the Art: Nowhere was the intervention of France in the American War of Independence more transformative than at sea. Exploits of individual ships and their crews captivated the American public, and no one provided more inspiration than John Paul Jones. In February 1779, King Louis XVI of France provided the Scottish born American captain - who had already gained fame as a privateer - with a ship that Jones dubbed the Bonhomme Richard after Benjamin Franklin's Poor Richard's Almanack. With this new weapon, Jones prowled the coast of Scotland, panicking British civilians and capturing numerous prize vessels. Jones's gadfly career seemed doomed to a premature and inglorious end on September 23, 1779. While leading a squadron of four vessels in the North Sea, the Bonhomme Richard came upon the forty-four-gun frigate H.M.S. Serapis escorting a convoy of some forty merchant ships from the Baltics. The Bonhomme Richard daringly engaged in combat with the larger and better-armed Serapis. Although both ships were badly mauled early in the battle, the Bonhomme Richard seemed doomed. Certain of victory, the British captain demanded Jones' surrender. Instead, so the story goes, Jones bellowed, "I have not yet begun to fight!" and fought on. After Jones finally managed to lash the two ships together, a hand-to-hand combat went on for three-hours until the exhausted and bloodied British surrendered. The Bonhomme Richard sank amidst the flames, but the new nation's flag was raised on the deck of Serapis. News of the contest would inspire not only the Revolutionary generation, but also many generations to come.